A new study, involving researchers from the University of Southampton, has found that microscopic ocean algae called coccolithophores are providing clues about the impact of climate change both now and many millions of years ago. The study found that their response to environmental change varies between species, in terms of how quickly they grow. 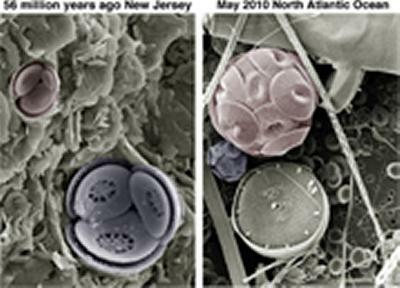 The fate of coccolithophores under changing environmental conditions is of interest because of their important role in the marine ecosystem and carbon cycle. Due to their calcite shells, these organisms are potentially sensitive to ocean acidification, which occurs when rising atmospheric carbon dioxide (CO2) is absorbed by the ocean, increasing its acidity. “This work provides us with a whole new way of looking at living and fossil coccolithophores,” says lead author Dr Samantha Gibbs, Royal Society University Research Fellow at the University of Southampton. “We use knowledge of how coccolithophores build their calcite skeletons in the modern ocean to interpret how climate change 56 million years ago affected the growth of these microscopic plankton,” adds co-author Dr Alex Poulton, a Research Fellow at the National Oceanography Centre.